In 2-quart saucepan, heat water, rice and salt to boiling; stir. Reduce heat to low; cover and simmer 1 hour or until most of the liquid has evaporated and rice pops open. Drain; set aside to cool. Meanwhile, heat oven to 400°F. With hands, grease baking sheet with the 1 teaspoon olive oil. With oiled hands, press pizza dough into 6-inch circle onto baking sheet. Bake 13 to 15 minutes or until crust is dry and bottom is golden brown. Remove from baking sheet; cool on wire rack. Cut crust into bite-sized cubes. Reduce oven temperature to 350°F. Grease 2-quart casserole. In 12-inch skillet, heat the 2 tablespoons olive oil over medium-high heat. Cook and stir chorizo, onion and garlic 5 minutes or until onion is soft. Stir in parsley and sage; cook 1 minute longer. In large bowl, stir together wild rice, pizza crust cubes, chorizo mixture, chicken broth, salt and pepper. Spoon into casserole; cover with aluminum foil. Bake 20 to 25 minutes or until heated through. Serve immediately. 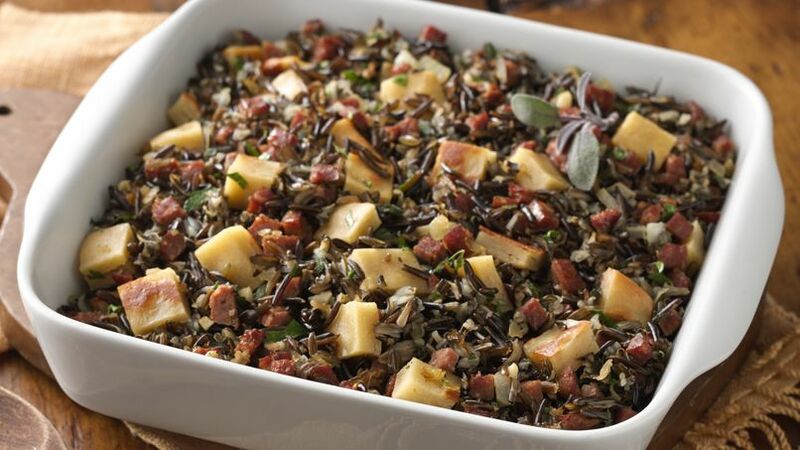 Save time by starting with 2 (15 oz) cans cooked wild rice instead of cooking it yourself. Try substituting white rice for wild rice and using chorizo for for a more flavor packed dressing.